Nichols, a lover of reading and inspiring her students to feel the same, was looking for a way to reignite her students’ passion for books during a time of the year when students and staff alike are starting to feel the itch of summer. After chatting with some of her teacher friends in Indianapolis, she learned of the “Starbooks” idea. Nichols’ friends shared some materials, and she put her own twist on the rest. 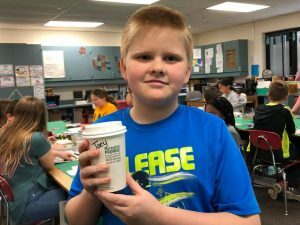 Thursday, the day before spring break was set to start for La Porte, Nichols’ fifth grade students walked into their usual classroom, only it was transformed into replica of Starbucks. The traditional Starbucks green covered the tables and boards, with a fun twist on Starbucks drinks including Non-Fiction Frappe and Poetic Pink Drink. Nichols received donations from the local Starbucks of cups and lids and even a green apron to ensure that she’d be a true barista. 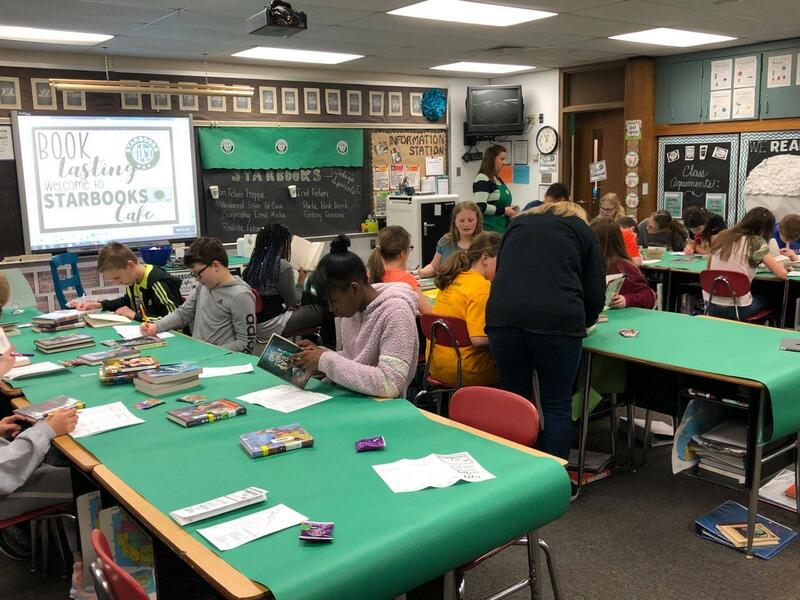 The whole purpose of the activity was to help students find new books to enjoy for the rest of the school year and possibly beyond. 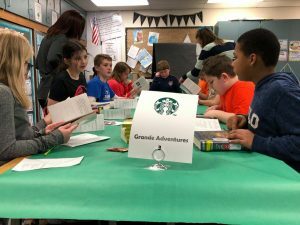 Three tables were filled with texts of different genres, and Nichols personally invited and seated students to sit at specific tables. From there, students filled out sheets that had them analyze the book’s lexile score, genre, hook, interesting parts, and various other aspects. They were able to discuss all of this with their tablemates, allowing for high level thinking and discussions. “I thought the activity was very successful. All of the students found books that they couldn’t wait to read. They were socializing, but they were also using good book talk etiquette that has been modeled and practiced all year,” Nichols said. The room buzzed with excitement as classmates passed books back and forth, encouraging their friends to check out the text. Students could be heard telling tablemates that they’d like certain books because it was “realistic fiction,” and they knew their friends enjoyed that. One young girl even mentioned to her friend that just because the book was over 400 pages he shouldn’t overlook it. The desired passion for reading was not only evident but bubbling over. “It’s fun to get to know books you haven’t seen before. When we go to find books, we usually only find the ones that are popular. It’s fun to see new books,” Cooper Aftowski, 5th grade Sip ‘n See attendee, said. Even the most reluctant of readers were completely enthralled in the activity. Nichols watched as a student who could never find a book kept telling classmates that she couldn’t wait to read one of the books on the table. She made sure everyone knew that ones of the copies of the story needed to be hers. After students filled up their sheet with book reviews, they were finally able to place their orders. Each one wrote down his or her top book choices and then went to front of the room to get a snack and drink from Nichols. 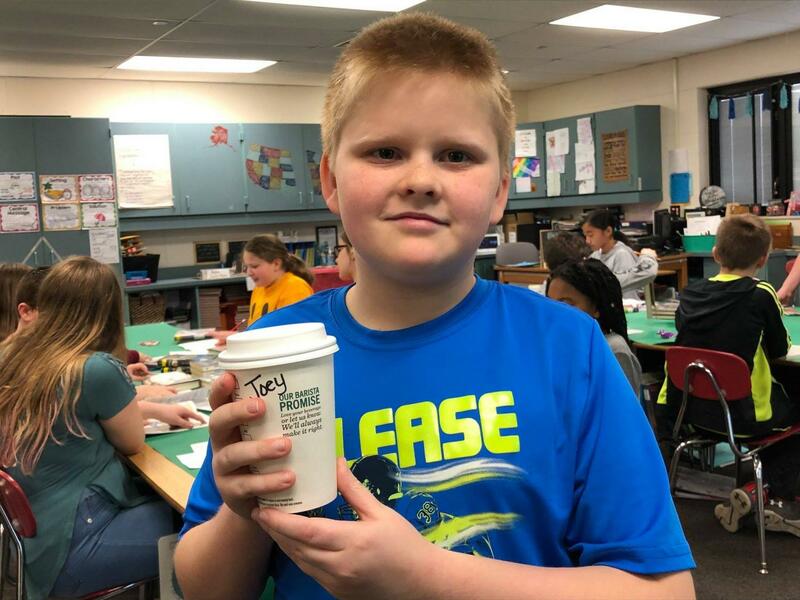 In true Starbucks fashion, she grabbed a Starbucks cup, wrote the student’s name on the front, and served them a drink. From there, students enjoyed snacks and drinks while diving into their top book. It was a day to remember for both students and barista. Education has such a beautiful opportunity to turn learning into such sacred moments. “I am blessed with the opportunity to work with these amazing students and an equally wonderful village that wraps around us and helps me make learning exciting! I couldn’t have asked for a better outcome!” Nichols said.